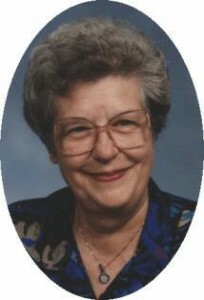 Bernice M. Beer, 81, died Monday, December 14, 2009 at Lasata Care Center in Cedarburg, Wisconsin. She was born April 22, 1928 in Port Washington, Wisconsin the only child of Walter and Della Ewig Ohm. She graduated from Port Washington High School in 1946 and attended Deaconess Hospital School of Nursing in St. Louis graduating in 1949. She married Kenneth Beer from Milwaukee on October 21, 1950 in Port Washington. Bernice worked as a nurse at the former St. Alphonsus Hospital and later Columbia Hospital in Milwaukee for 18 years. She was also a private practice nurse and nursed at Lasata. Her husband was a manager for Coca-Cola and they moved around. They lived in Milwaukee until moving to Brown Deer in 1955 In 1968 they moved to Concord, CA and then moved to Danvers, MA in 1972 for a year. In 1976 they moved to Orland Park, IL and returned to Port Washington in 1981 residing on W. Chestnut Street. She was a member of St. Paul’s Lutheran in Brown Deer and on their Alter Guild for 12 years and a member of the Brown Deer Civics Club. She was a Cub Scouts Den Mother and set up the Christmas Trees for the churches she was a member of. She volunteered for the Red Cross of Ozaukee County, was active with St. John’s Lutheran Church in Port Washington and was the secretary/treasurer for the Port Washington Cemetery Association for many years. She was a Packer fan, avid reader and enjoyed collecting plates and figurines. She valued her Port Washington family and city heritage, her father was a former Port Washington Street Commissioner and her husband a former City Alderman. Always interested in current events and people, she stayed in touch with family and friends, clipping and sending articles to them. Her husband preceded her in death May 12, 1995 and in 2005 she moved Meadowmere of Mequon and in August of 2009 moved to Lasata Care Center in Cedarburg. Bernice is survived by her son Dave (Cathy) Beer of Bryant, Wisconsin and Granddaughters Megan (Tommy Pemberton) Beer, Emily Beer and Sarah Beer. Further survived by cousins Ellen (Don) Nelson of Blaine, Minnesota and Cliff (June) Rathke of Cedarburg, Wisconsin, other relatives and friends. Preceded by her husband Ken and son Bruce. Funeral services 11 am Thursday, December 17, 2009 at First Immanuel Lutheran Church, W67 N622 Evergreen Blvd, Cedarburg. Visitation 4-7 pm Wednesday, December 16, 2009 at the FUNERAL HOME and 10-11 am Thursday at church. Memorials to First Immanuel Lutheran Church appreciated.